An increasing number of patients with diabetes are taking advantage of a Medicare benefit for therapeutic shoes, but more could make use of the preventive measure to avoid further complications and possible amputation, practitioners say. Posing an obstacle, however, are the increased paperwork demands and looming fee cuts to physicians by the Centers for Medicare and Medicaid Services (CMS). The Therapeutic Shoe Bill, the congressionally mandated benefit instituted in 1993, pays about $67 for off-the-shelf shoes and about $200 for custom shoes made for Medicare patients who meet specific criteria. These include previous amputation or foot ulceration, a history of pre-ulcerative calluses, peripheral neuropathy, foot deformity, or poor circulation in either foot. However, he said, the benefit should be increased to more realistically cover costs. 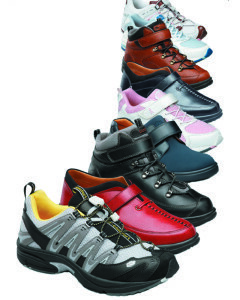 According to the Pedorthic Footwear Association, use of the benefit for off-the-shelf shoes increased from about 1.05 million allowed services in 2003 to almost 1.6 million in 2007, the latest year for which figures are available. Utilization for custom-molded shoes declined slightly from about 41,000 allowed uses in 2003 to about 40,000 in 2007. Eligible patients qualify for one pair of shoes a year. Physicians have to certify that patients need the shoes and supply a prescription. But new paperwork requirements have complicated use of the benefit, said Dennis Janisse, CPed, president and CEO of National Pedorthic Services and a clinical assistant professor of physical medicine and rehabilitation at the Medical College of Wisconsin in Milwaukee. “A major issue now is a new requirement for having a primary physician’s progress notes along with a prescription,” he said. Beginning January 1, 2011, the notes must indicate that the treating physician has actually seen the patient within six months prior to delivery of the shoes. This can put an undue burden on downstream practitioners to locate information. Even if the notes exist, if all the criteria for the reimbursement are not specifically listed, “people aren’t getting paid,” Janisse said. Any time you deal with the government, paperwork is required, said Jay Lifshen, DPM, a podiatrist in Irving, TX. But recent auditing efforts by Medicare make it clear that primary care physicians need to show in their records that shoes will benefit the diabetic patient, and a specific form has to be signed by the physician. “The more paperwork, the more burdensome it makes for doctors, and the less [likely] doctors are going to provide the service,” he said. With Medicare fee cuts looming, the therapeutic shoe benefit is one area where physicians can make up for those cuts—provided they are still accepting Medicare patients, Lifshen added. Practitioners agree that efforts should be stepped up to increase patient and physician education about the shoe benefit, which might require special reinforcement. Janisse is trying to convince the CMS to ease up on some of the recent changes so that more patients can get the help they need. In addition to being an inconvenience, the extra paperwork is a financial disincentive for practitioners. Happy New Year LER, every practicing Pedorthist is in this unfortunate situation of increase documentation because i think of the actions of a few. On the surface all this docomentation actually helps with compliance and the concept of treating our diabetics as a team, however it does put undo pressure on the physicians and their support staff so what we have been seeing is patients just declining to be fitted which in the long run not could but will lead to some serious foot complications. Patients would rather just go out now and purchase a cheap, poor ill-fitting shoes rather than go to the doctor. As usual the only while the debate goes on there are hundreds of patients making ill-advised decisions that are not in the best interset of their health. Diabetes is no joke and hopefully we will find a resolution that benefits the patients before it does not matter.